Noir at the Bar: Queens will be happening Thursday, Aug. 7 at Odradeks Coffee House and Wine Bar in Kew Gardens. QUEENS — Kew Gardens is considered one the most tranquil and crime-free neighborhoods in Queens. But next Thursday it will become the epicenter of crime and mystery during the first 'Noir at the Bar' book reading. A group of writers, including bestselling authors such as Hilary Davidson and Reed Farrel Coleman, will read excerpts from their upcoming or recent books at Odradeks Coffee House, which, coincidentally, is located in the same building where Kitty Genovese was killed 50 years ago, the murder which has haunted the neighborhood since. First held in Philadelphia in 2008, 'Noir at the Bar' events have since spread across the country, and are held in a number of cities, including Washington, D.C., Baltimore and New York. This will be the first such reading in Queens, said Alex Segura, 34, a Kew Gardens crime author, who is organizing the event. Other writers reading at Odradeks next week include Richie Narvaez, who is the president of the New York Chapter of Mystery Writers of America, Thomas Pluck, who organizes similar events in Manhattan, as well as S.A. Solomon and Angel Colon, according to Segura, who will also read from his book, "Silent City." Segura, who is originally from Miami, moved to New York in 2006 and works for Archie Comics. His first book, "Silent City," was published last year. The novel is about a journalist who gets dragged into a search for a missing person. Segura said that Kew Gardens’ literary scene has been growing. Odradeks, which serves as an unofficial cultural center in the neighborhood, has held several reading series in recent years, showcasing local writers and poets. During the event next week, each author will read for about 12 to 15 minutes, Segura said. The writers will also "be raffling copies of books to attendees,” he noted. 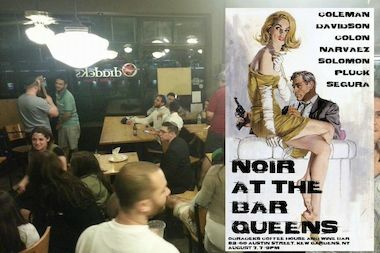 'Noir at the Bar: Queens' will take place on Thursday, Aug. 7, at Odradeks Coffee House and Wine Bar from 7 p.m. to 9 p.m. The event is free and open to the public.